Well, we're trying something new with our tomatoes this year. Instead of using cages or staking them and using twisty ties to secure the stems to the stakes, we're doing the Florida Weave. It kind-of sounds like a dance, doesn't it? You can picture it- people in their Bermuda shorts and sun hats miming the weaving of wicker patio furniture. 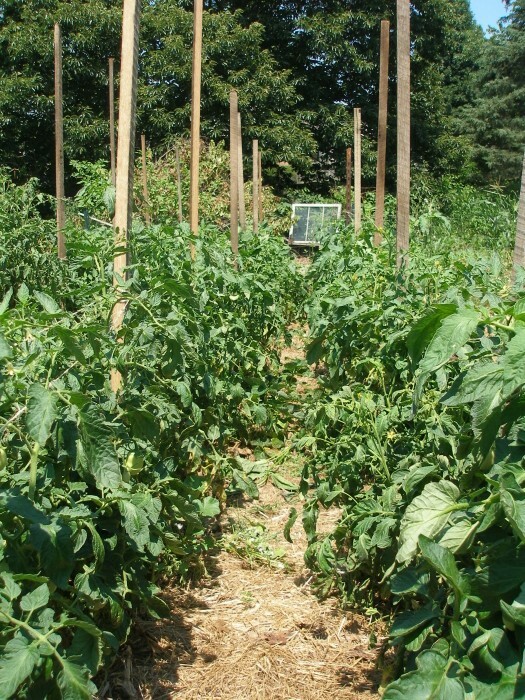 The general idea is that instead of tying your plants to stakes, you weave twine around stakes placed throughout your rows. You do this every 8 inches or so as your tomato plants grow. 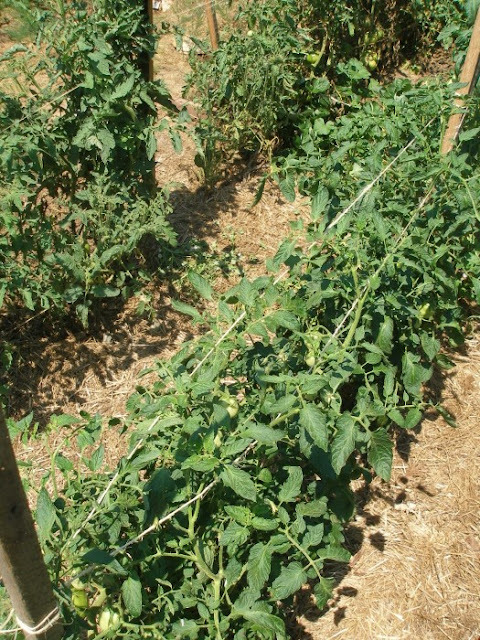 The tomato plant is held between the two strands of twine (at different heights) which support them gently. A farmer friend of ours who runs a CSA and sells at our farmer's market does his tomatoes this way, so Jamey wanted to follow suit. 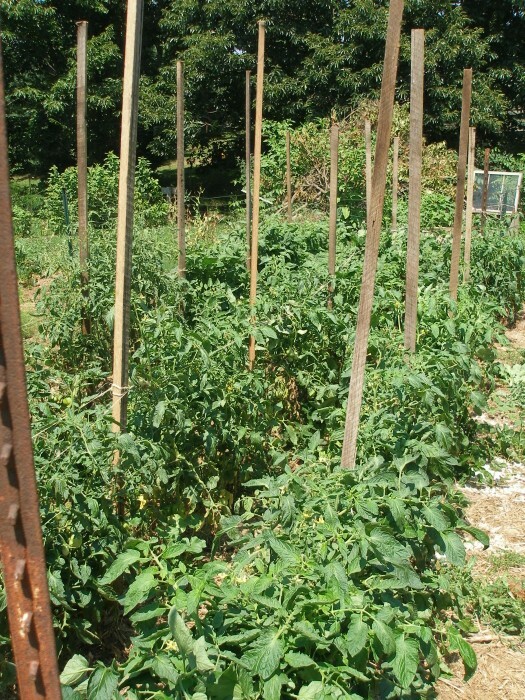 It allows for easy-to-navigate rows (important in a semi-cramped garden like ours) and makes the tomatoes very accessible for picking. I helped add the next row of twine this past weekend and am sold on the method. Here is helpful tutorial on how to do the Florida Weave (You can't help but picture the dance, can you?) and below are more pictures of how ours look. Sounds like a great idea. I think we'll give it a try! That's what we're trying this year, too. I didn't know that it had a name so fancy. I'm not really sure what I'm supposed to do, but I did it anyway. Do you keep tying them up and up and up? We started doing this last year and it worked great! They supported each other well in storms with high winds too. As long as your tomatoes keep growing (up and out), continue to weave twine every 8 inches to help hold the growth:-). Looks great. I tried this last fall, but, my tomatoes eventually got too tall for me to keep up with (could be my climate or tomato type)..good luck! Thank you for sharing this technique...I am definitely going to try it. We are dealing with a tomato jungle right now!! Yet another new one! How neat. Thanks for sharing! I'm trying something similar, but I'm falling behind. My tomatoes seem to be trying to take over the yard. Definitely going to have to try this. I seem to fight with tomatoes every year. Thanks for sharing. You can pinch out your growing points on your tomatoes when they get tall enough for your liking. Just happened on your blog from Zoedawn- loving your posts. This one is especially of interest right now as we are overwhelmed by out of control tomato plants. My husband & I were just talking about how we need to do something different next year- then came upon your post! Will be trying it next year definitely! I was also interested in the variety of zucchini breads you have made- never ceases to amaze me all the different ways to get veggies (hidden) into other foods that kids (and adults) like! Just saw your post from yesterday and ended up here. Is this a good method for determinate or indeterminate tomatoes? We think it would work well with either. If you use the weave for indeterminate, just keep in mind they may grow taller than the other so you need to make sure your posts are plenty tall so you can add additional twine levels as needed. We plant indeterminate and it worked well for us.